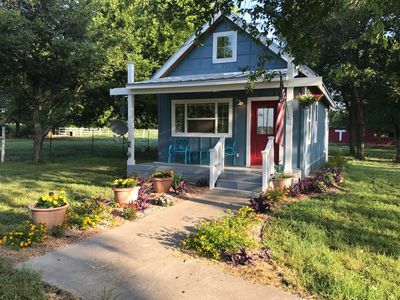 Come spend a relaxing retreat at 'The Willows Nest Inn,' a 3-bedroom, 2-bath vacation rental home situated on a beautiful plot of land in the heart of Texas. Enjoy the sweet simplicity and relaxations of life when you stay at this lovely home that sleeps 10. You'll love the small town feel of Moody and the proximity of cities such as Temple, Austin Salado, Waco, McGregor, Gatesville, and Crawford. The enjoys views of surrounding horses and farm fields from the front and back porches. Let your dream of leaving the hustle and bustle of everyday life become a reality when you stay at this private home in Moody. 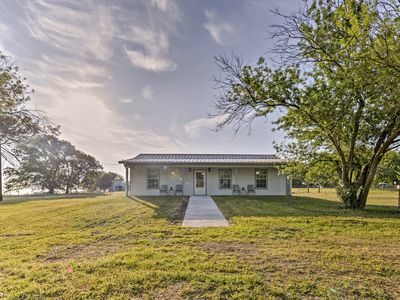 Spend days enjoying the views from the two porches, soaking up the sun as you explore the land the home sits on, venture to museums, cities, and nearby Belton Lake for a day of exploring. 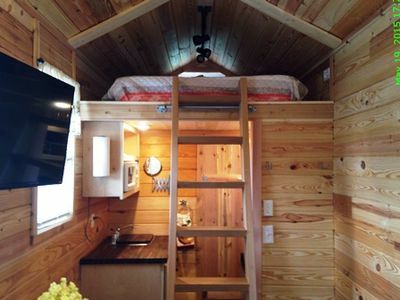 This residence is a great size and layout for your next family vacation. The home boasts lovely furnishings, stainless steel appliances, gathering spaces for everyone to convene and create memories, and an ample amount of the great outdoors. You'll also be provided with basic toiletries like soap, shampoo, conditioner, and more. After traveling all day, you can unwind in the open concept living space with a flat-screen TV, comfy leather chairs and couch, and a table perfect for playing a family card game! Once everyone has worked up an appetite, cook a meal in the fully equipped kitchen or whip up some burgers on the grill. Share your meal at the large, 6-seat wooden dining table. Go say hello to the horses on the other side of the fence in the backyard and go for a walk around the property while you bird watch. Retire to the back porch to sip a glass of wine or head to the backyard's brand new fire pit to relax around a Lone Star State bonfire in the new chairs (which can also convert into a picnic table). When you're ready to call it a night, make your way to the master bedroom with a king bed, flat-screen TV, stunning furniture, and an en-suite bathroom with a double vanity and shower/tub combo. Wake up, get energized with a cup of coffee, and decide what Texas adventures you want to pursue! Moody boasts a quaint downtown with local restaurants and endearing architecture that provides you with a true country feel. For an authentic country meal head just 6 miles down the road to Lucy's Cafe, then walk the streets of downtown Moody to experience the small-town charm. Temple, Texas is a great city to visit museums, eat out, and walk around and is only 13.5 miles from the home. After a morning exploring Temple, continue south 10 more miles to Salado for shopping and a nice dinner at Johnny's Steak House. The adorable town of Waco is just 31.2 miles away and you'll love visiting the score of shops and restaurants galore. You may even spot Chip and Joanna Gaines from the famous HGTV show 'Fixer Upper' looking for their next home to flip! For a more outdoor focused day, venture to Mother Neff State Park 12 miles away for some scenic walks. You can also drive 13.6 miles to Belton Lake. Hike around the lake, fish, swim in the water and sunbathe. Bring a cooler and enjoy some refreshments and snacks on the shore. Other nearby lakes include Stillhouse Lake and Waco Lake. Bring your boat, kayaks, or canoes for a day out on the water! Take your canoe down to the Brazos River in Waco for an unforgettable day on the country's 11th-longest river. If you want to make a longer drive for a day trip, Austin is a little over an hour away and offers amazing sites, dining, shopping, and entertainment! No matter what activities fill your day, make sure you're home in time to enjoy a drink on the porch to watch the sunset.